Overnight the yellow fungus? appeared on new mulch under 2 similar plants. Do you know what it is and how to eliminate it? Thank you for contacting us with your gardening inquiry. From your photo it appears that you have a classic example of what is commonly known as “Dog Vomit Fungus”. Although it is refered to as a fungus Fuligo septicai is in fact a slime mould. It is most likely to show up during warm, wet periods,which is exactly what we have been experiencing, sometimes seeming to pop up out of nowhere overnight. Slime moulds such as Fuligo septicai are saprophytic, which means that they feed on decaying organic materials. They are not diseases, and won’t really harm your plants. 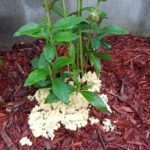 Occasionally, they’ll grow on plants that are growing in mulch, and if a large enough colony forms, they may smother the plant. This is uncommon, however, and you’ll usually just find the mold in the mulch itself. If your mulch stays steadily wet, you might want to stir it up a bit to let it dry out to prevent more mould growing. Once the slime mould itself dries out, you can just dig it up and throw it in the garbage, do not put it in your compost bin. It is more common on the coloured mulches.